The Sega Dreamcast (ドリームキャスト) is a home video game console manufactured by Sega as a successor to the Sega Saturn. It was originally released in November 1998, becoming the first machine to be released in what is now known as the sixth generation of video game consoles, sharing a platform with the PlayStation 2, Nintendo GameCube and the Xbox. The Dreamcast was Sega's last home video game console, and was discontinued in early 2001. It sold at least 8.2 million hardware units and 51.63 million software units by March 2001,Media:AnnualReport2001 English.pdf and up to 10.6 million hardware units in total. An arcade counterpart to the Dreamcast exists as the Sega NAOMI. The Dreamcast is a small, white box with aesthetics designed to appeal to a wide-ranging audience. It was envisioned as an "128-bit" "super console", designed to leapfrog "32-bit" and "64-bit" contemporaries in the form of the PlayStation and Nintendo 64, respectively (although from a technical standpoint, its main processor deals in 32-bit or 64-bit instructions, with the 128-bit figure coming from the graphics hardware). Incidentally the Dreamcast was the last home console to use "bits" as a selling point, with processing capabilities now typically measured in other ways. 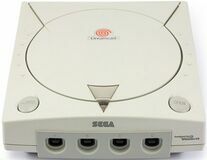 Taking design cues from the Nintendo 64 and the Sega Saturn, the Dreamcast contains four control ports, a removable modem, disc drive and an extension port (as well as the expected AV and power inputs). It is not backwards compatible with any prior Sega hardware or software (although its controller derives from the Saturn's 3D Control Pad), and operates in much the same way as the Saturn (and PlayStation) does, with a configurable settings and memory management accessed through a BIOS screen. The Dreamcast uses a proprietary format of storage called GD-ROMs for games in order to circumvent software piracy, a strategy that ultimately backfired when the first run of discs had a high rate of defects. The format was also cracked fairly quickly (and in some cases, the pirated games were released before the legitimate versions). 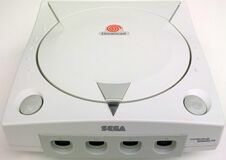 Sega largely had themselves to blame for the high levels of Dreamcast piracy—their use of the GD-ROM format was completely undermined by the console's support for the Mil-CD format, which allowed the console to boot from a standard CD-R. Mil-CD support was removed from the final Dreamcast revisions toward the end of the console's life. The GD-ROM format also put the console at a disadvantage when competing against the PlayStation 2 - the PS2 used DVDs, and could therefore run DVD videos making it an inexpensive DVD player as well as a video game console. DVD-ROMs also have more storage space, allowing for bigger games (though the initial run of PS2 games used a blue CD-ROM format). Sega looked into DVD technology during the Dreamcast's development but claimed it was too expensive. The Dreamcast was the first video game console to ship with a built-in 56k modem, with broadband adapters being made available later on in certain regions. This allowed the system to connect to the internet using a custom, fully-functional web browser and e-mail client. Many games released for the Dreamcast shipped with online play modes, the most popular being Phantasy Star Online and the Sega Sports lineup (now published under the ESPN label). 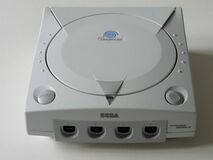 Although other consoles before the Dreamcast had network gaming support, such as the Sega Saturn's NetLink and the Sega Mega Drive's XB∀ND, the Dreamcast was the first game console to include this ability out of the box and is therefore considered the first internet-enabled home game system. The Dreamcast has a modest hacking enthusiast community. The availability of Windows CE software development kits on the Internet—as well as ports of Linux (LinuxDC) and dreamcast NetBSD operating systems to the Dreamcast—gave programmers a selection of familiar development tools to work with, even though they do not really support the high speed graphics. A homebrew minimal operating system called Kallistios offers support for most hardware, while not offering multi-tasking, which is superfluous for games. Many emulators and other tools (MP3, DivX players, and image viewers) have been ported to or written for the console, taking advantage of the relative ease with which a home user can write a CD which is bootable by an unmodified Dreamcast. Sega released an arcade board, using the same technology as the Dreamcast, called Sega NAOMI, leading to many Dreamcast-exclusive games with a high level of arcade quality. The Dreamcast's PowerVR CLX2 was the first GPU for a home system with hardware capabilities such as bump mapping, volumetric effects, order-independent transparency, and Dot3 normal mapping. Japanese Dreamcasts can be identified by the triangle at the front of the unit. Though the power LED is identical across all regions, the piece of plastic attached to the lid of the Japanese model is transparent, while in North America it is grey. The Japanese models also have the text "Designed for Microsoft Windows CE" printed on the front right, whereas Western versions say "Compatible with Microsoft Windows CE". For a full list of special edition Dreamcasts, see Special Dreamcast Models. Main article: Sega Dreamcast/Technical specifications. Main article: Sega Dreamcast/Hardware comparison. Main article: History of the Sega Dreamcast. Main article: Sega Dreamcast games. Main article: Sega Dreamcast/Magazine articles.